Answer: A neutral Phosphorus Atom has five valence electrons. These are contained in the third energy level of the atom. Phosphorus is an element which is part of Group 15 (formally known as the Pnictogen group) and is directly below the nitrogen atom. 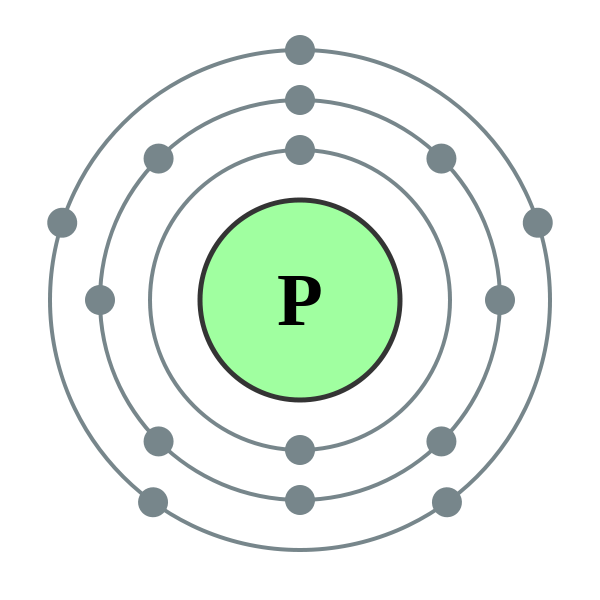 As was mentioned before, a neutral Phosphorus Atom contains five valence electrons in the third shell. You can see a Bohr Model of Phosphorus below this paragraph. It also supports the original answer of five valence electrons. Due to the number of valence electrons, Phosphorus is capable of forming three bonds with other elements. Yet since it has a third-energy level, it can form more than three bonds if it is favorable to do so. Phosphorus tends to form an anion even though it has a low electronegativity. Due to its high reactivity, phosphorus is never found a pure element on earth. The Valence Electrons are found in different types of orbitals. Two are in the s-orbital (a circular orbital) while the other 3 are in p-orbitals (bell-shaped orbitals). There are a total of 4 orbitals in the valence shell to minimize electron-electron repulsion. Since their is less electron-electron repulsion, this formation is actually more stable than one with an extra electron. Therefore Phosphorus has a higher ionization than its Group-16 (Chalcogen) neighbors Sulfur. Phosphorus is necessary for some functions in life and is an essential component of fertile soil. It moves as a compound (not as a pure element) through what is called the Phosphorus cycle from the soil to plants and then back into the air before returning to the soil. Phosphorus is also essential component of matches. It was discovered in 1669 by Hening Brand.